There are 7 lessons in The MathRoom Cal-Prep Review. 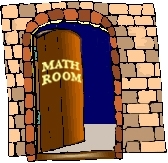 Before you start, read the MathRoom Method again and the MathRoom Instructions file, then follow the directions to the letter. Keep in mind that PRINTING OUT THESE FILES IS STRICTLY FORBIDDEN!!! Anything you want on paper should be written by hand and spoken as it is written. You have 2 weeks from sign-up to complete the course. If any of these topics give you a lot of trouble, you should cover it in a follow-up lesson, once this course is completed. As you work, make good "presentation" habits -- because in math, form counts as much as function. List the information in the question to start. Don't mish everything together and make sure your work is legible and precise. with "cal-prep-help" in the subject line.